War is a frightful business, but sadly seems to be hard-wired into the human animal. Its depiction throughout the last thousand years has tended to be a kind of victory celebration. (Think of the Bayeux Tapestry.) It’s full of heroic deeds, a conquering army and a crushed enemy. Delacroix painted an unbelievably heroic, swashbuckling Napoleon, Crossing the Alps. Think too of Tennyson’s Charge of the Light Brigade, an epic poem glorifying heroism in the face of overwhelming odds. These are emotions and sentiments which are understand-able, but they make war seem a sort of adventure, some-thing all stout-hearted and patriotic people might find rather exciting, fulfilling even. There were exceptions. Goya didn’t spare his audience the appalling horrors of conflict — in, for example, The Disasters of War. But there seems to have been a sea-change, a reaction to the nightmare of WW1. The introduc-tion of conscription in 1916 changed the nature of the armed forces; instead of a pro-fessional army, all able-bodied men within the appropriate age group were required to serve. Thus the grim reality of all-out war was felt in some way by everyone. The War Poets in particular seized the public imagination in imagery which is both horrific and intensely moving. What about the artists, the painters? 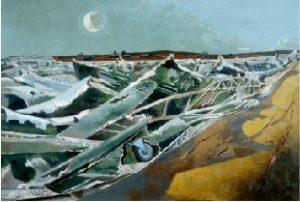 The war artists of the two world wars could make a subject for a future article, but for this writer, one in particular stands out: Paul Nash. Born in 1889, Nash was a student at the Slade before the war, where his teach-ers included the formidable Henry Tonks, a demanding draughtsman. Nash was very much a man of his times, and knowledgeable about the widely varied art movements of those days. He was one of only four artists who were official War Artists in both wars. (Curiously, his brother, John, was another.) 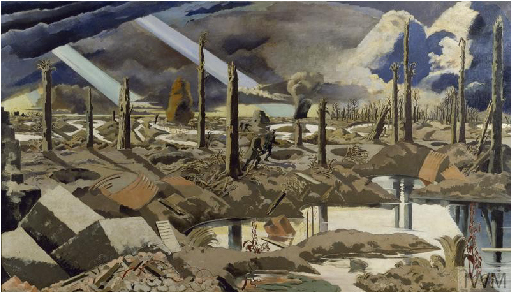 Paul Nash served as an officer in the Hampshire Regiment, in Ypres. In 1917 he fell in the trenches and broke a rib. Invalided home, he later returned to the front, now commissioned as an official war artist. Nash produced a huge number of on-the-spot sketches which he then worked up as finished paintings back in England. These are as far removed from the ‘glory paintings’ as it’s possible to be. One in particular stands out. I had known the painting in reproduction since student days. Its imagery of desolation and destruction, of the pathetic pointlessness of it all, are clear; but it wasn’t until we saw the painting proper, at the Laing Gallery in Newcastle last year, that its full impact struck home. It’s huge: 6ft high and over 10ft long. The overwhelming presence of it takes one’s breath away. We sat and looked, with lumps in our throats. The title is The Menin Road (see header image). This stark, angular style, owes something to both surrealism and cubism, but devel-oped here to express an almost unbearable despair. Two of Nash’s works from WW2 make for interesting comparisons. Totes Meer has an even more surreal, dream-like quality; a monument to destruction, a washed-up tide of war waste polluting the land-scape. 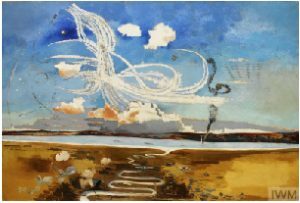 Battle of Britain (below) was painted in 1941, and whilst clearly figurative, with the chalk cliffs of northern France in the background and Cuckmere Valley in the foreground, the canvas can be read as an abstract. Nine of Pauls Nash’s canvases are held by the Imperial War Museum.